Walking into Leon wasn’t as tedious and the highway wasn’t as dangerous as we expected. No doubt all the kindnesses we were showered with this morning buoyed us up and took the edge off anything negative for the rest of the day. I felt so full to overflowing with an urge to “pay it forward,” even if it was with just a smile and a “buenos dias” in passing others. What a cheerful day! They keep getting better and better. When we were having our breakfast in Mansilla before heading to Leon, we happened to notice a brochure advertising new private rooms in an albergue in Leon. We had tried last night to find a place with a vacancy but with no luck. As a last-ditch effort, we asked Olga, the host or owner of the albergue where we stayed last night, if she wouldn’t mind phoning the albergue in Leon and enquiring about a vacancy. She was happy to oblige, and we were in luck. What a relief it was to know we would have a private room in Leon close to all the major sites on one of the busiest weekends of the year! 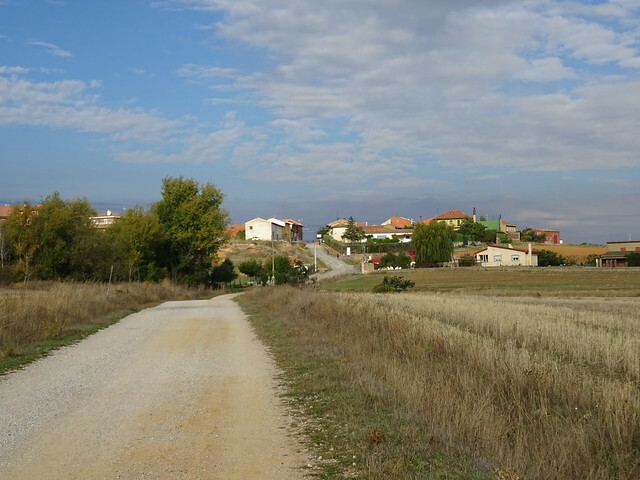 We had walked 5.7 km from Mansilla to Villarente and decided to fortify ourselves with another cafe con leche before walking the rest of the way into Leon. It wasn’t just coffee the two young people behind the counter brought us, but also two shot glasses of freshly squeezed orange juice, two cookies, four flaky pastries and, just before we were leaving, two little tapa sized potato tortillas on a slice of bread. Traditionally, peregrinos needed to rely on the kindness of people along the way to give them what they needed when they were on pilgrimage. The kindness these two showed us was like a “throw back” to days of old. Once we arrived in Leon, we sat down on a bench with our guidebook map trying to work out where we were in relation to the San Francisco de Asis albergue, our destination for the day. A woman approached us, holding out a brown bag and inviting us to help ourselves to what was in it. Now we are hooked on churros, deep-fried, sugary pastries that we sometimes call Mexican donuts. So they are in Spain too! These were fresh from the bakery, still warm, fragrant, and mouth-watering. They tasted like “MORE!” Our arteries might not like them, but we sure do. We were at a busy intersection and once again checking our guidebook map when a cyclist who was also checking his map struck up a conversation, peppering us with questions. Here is how the conversation went: Q – “Where are you from?” A – “Western Canada.” Q – “Where in Western Canada?” A – “Vancouver Island.” Q – “Where on Vancouver Island?” A – “Victoria area.” Q – “Where in the Victoria area?” A – “North Saanich.” He is a fellow “Victorian” and has been cycling for six days, having started in St. Jean as we did. He is so time-limited that he has to cycle as far as he can go every day and has no idea where he’ll be sleeping at the end of any given day. The private rooms in our albergue here in Leon are under serious renovation. Our room is “nothing to write home about” with its brilliant orange and mustard coloured walls. Let’s hope the colours will be changed during the renovation! The view from our window is of a concrete wall about eight feet from the window. Where are all the graffitti artists when you need them?! 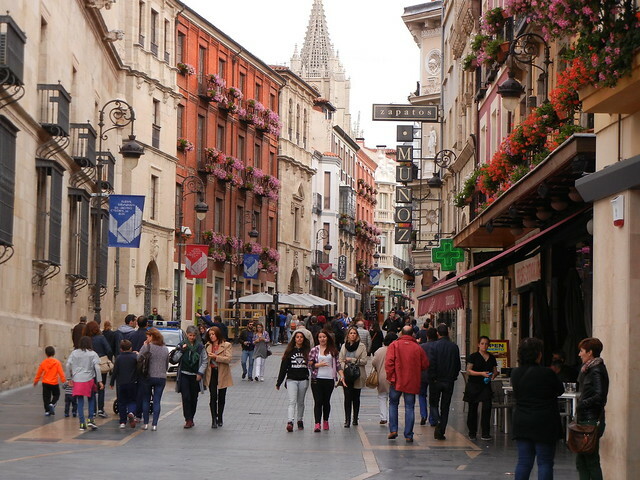 Once we settled into our room, we went exploring a maze of busy, narrow streets that connected squares and plazas in old Leon. A flea market filled with the most fascinating and ancient things was fun to browse through. 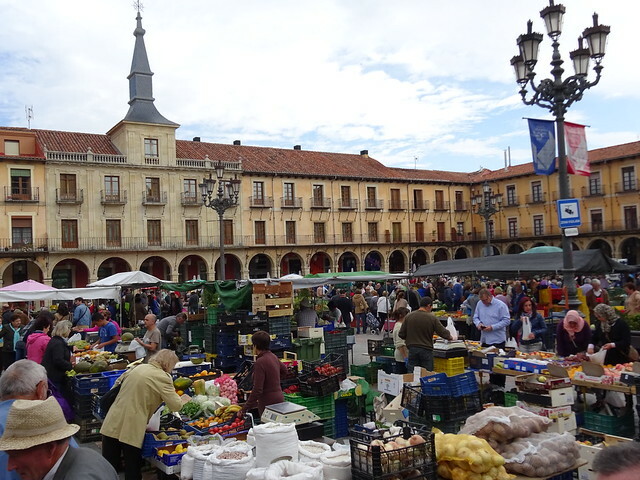 Then there was a huge produce market at the Plaza Mayor where we bought some apples. In other plazas people were eating and drinking at outdoor tables. The city was absolutely buzzing! 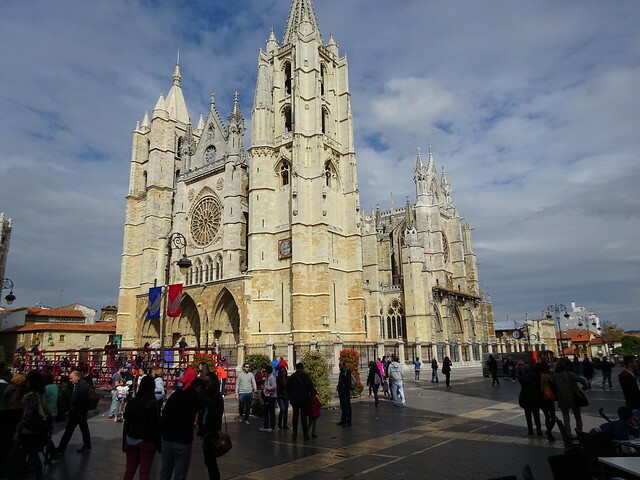 No pictures can ever do the Leon Cathedral justice! 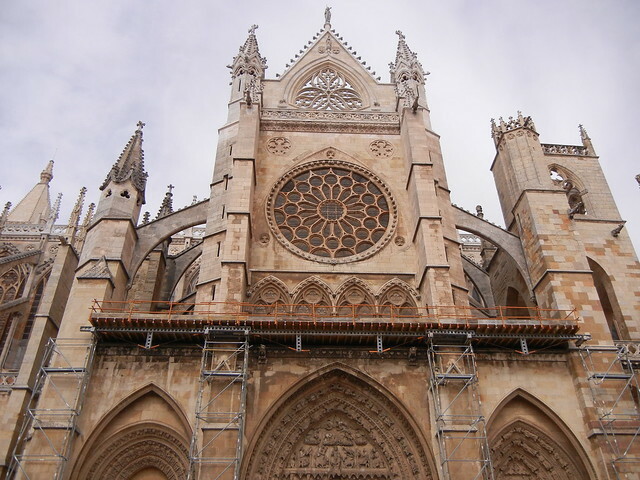 If Burgos and Leon are in competition about who has the better cathedral, our vote goes to Leon! 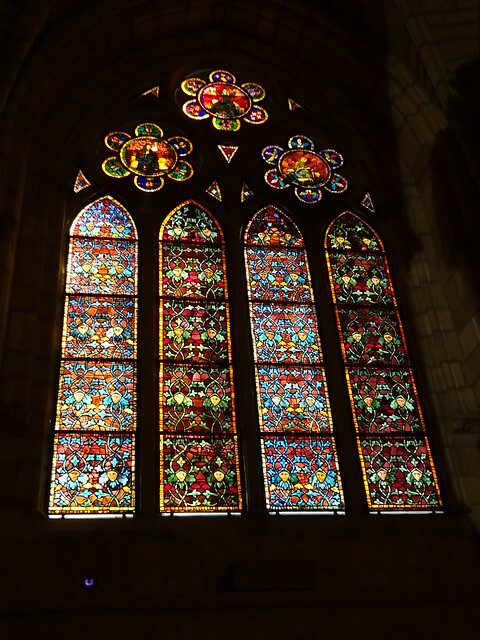 It is renowned for its magnificent 125 stained glass windows set high in the walls that shed lightness to the interior. Most Spanish churches keep out the light, but this one invites it in, showering a mosaic of colour over the interior. Hi Judy & Dave – I’m just catching up on a week’s worth of your blogs. 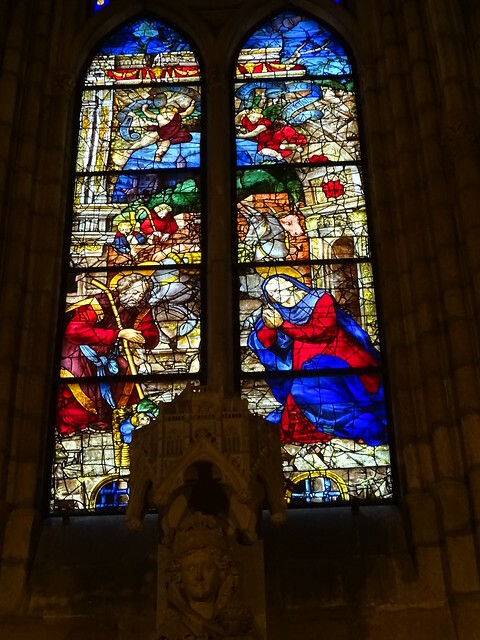 What an amazing adventure you’re having – particularly love this image of the stained glass in Cathedral at Leon! So reminds me of the beautiful glass in the cathedrals we saw in Italy a few years ago. Our enthusiasm is growing for our own journey, possibly next year, to the parts of England and Wales we love so much to do some ‘trekking’ as the Brits call it. A month of walking and 444 km. is such a fantastic feat – we continue to be inspired by you both and wish you continued good health, beautiful and joyous days!